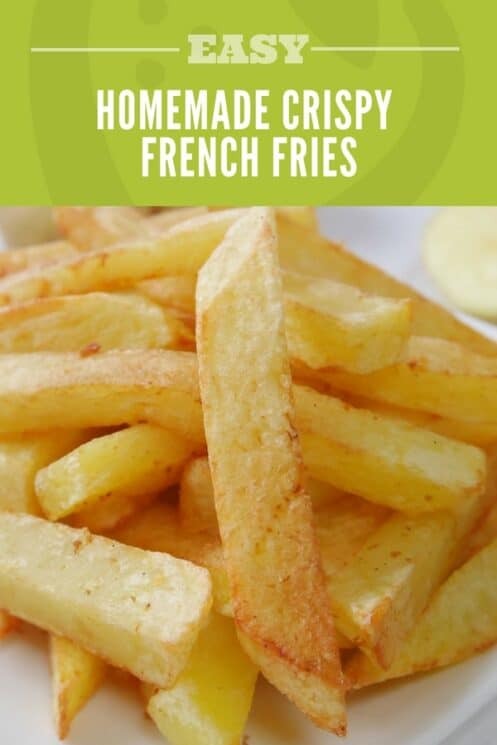 Our best Homemade French fries recipe for crispy fries, every time! We all love them. Admit it. Hot, crispy, yet fluffy potato french fries. It’s ok if you don’t want to admit it aloud. Just like you don’t want to admit that you have danced to Gangnam Style and busted a move. But we all know its true. The thing we don’t love is feeding our kids greasy, fried, unhealthy french fries with very little nutrition left in them. Potassium: Potassium is a mineral that is part of every body cell. It helps regulate fluids and mineral balance in and out of cells and in doing so, helps maintain normal blood pressure. Vitamin C: Vitamin C is a water-soluble vitamin that acts as an antioxidant stabilizing free radicals, thus helping prevent cellular damage. It aids in collagen production; assists with iron absorption; and helps heal wounds and keep your gums healthy. Vitamin C may help support the body’s immune system. Fiber: Dietary fiber is a complex carbohydrate and is the part of the plant material that cannot be digested and absorbed in the bloodstream. Soluble fiber may help with weight loss as it makes you feel full longer, and research has shown it also may help lower blood cholesterol. Begin with some nice Russet potatoes. 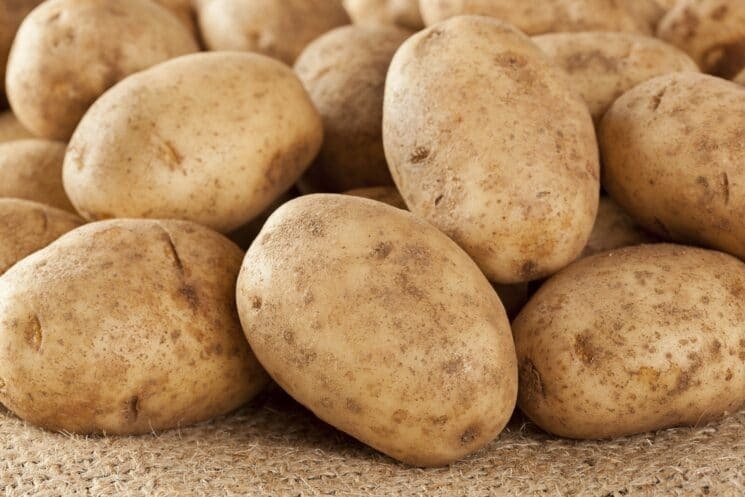 You can use any potato, but the russet potatoes are great because they have the perfect level of moisture. Peel the potatoes with a potato peeler. This is one area that the kids can get involved. Learning to use a potato peeler is a basic cooking skill that is easy for little hands to master. 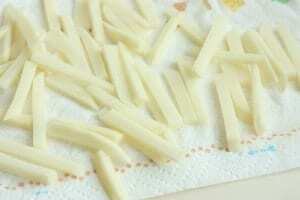 After the potatoes are peeled, cut them in half lengthwise. If they are very large, you can cut them in half again to create sticks that are half as long. Slice the long way and cut into even thin pieces. The more evenly thick you can cut them, the more even they will bake. 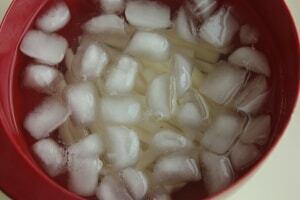 Put them in a bowl of ice water and let them soak for about 20 minutes. This helps remove starch and make them more crispy. You don’t have to soak them, you can just give them a good rinse if you don’t have time. Next put them in a ziploc bag with 1-2 tsp of oil and shake to coat. Line a baking sheet with foil, and place a cooling rack on top of it. Lay the potatoes on the cooling rack so that they are not touching. Sprinkle with salt. Serve with ketchup and enjoy! These were SO good and the best part is that it just potatoes! We don’t make these often, but they are definitely a fun treat that my kids love to eat when we do. And I feel great letting them eat them! 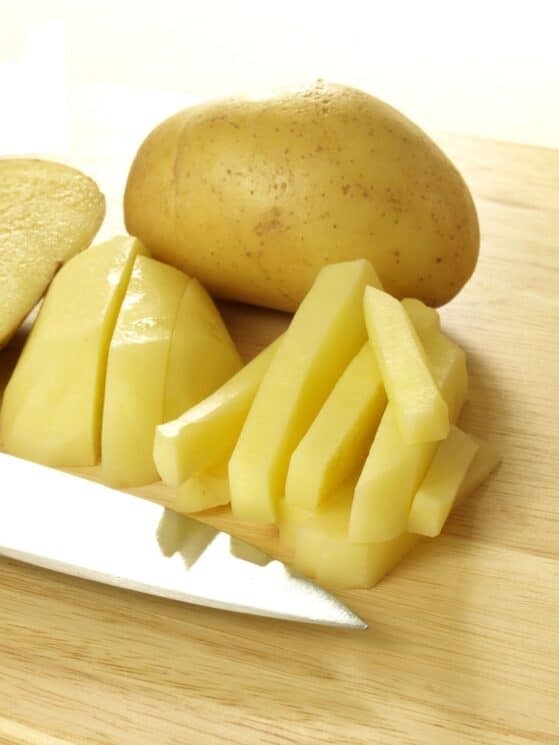 Peel the potatoes and cut in half and then half again. Next put them in a ziploc bag with 1-2 tsp of oil and shake to coat. Line a baking sheet with foil, and place a cooling rack on top of it. Lay the potatoes on the cooling rack so that they are not touching. Sprinkle with salt. Wow, looks super good. I want to try some. 🙂 Definitely will make them today. Thanks for the idea! Yum! We love these. Although I’ve never tried the technique – I’ll have to try it next time. We also love to make them with sweet potatoes, and flavoring with cinnamon and a touch of nutmeg. Very yummy! Yum! We love sweet potato fries also! I mentioned using olive oil in the recipe which worked great for us! Hi Natalie! Although committed to give healthy food to my kids, lack of time is a big thing… If I prepared a lot more in advance, do you think it would be ok to freeze them and use it later? And at what stage should you freeze? After cutting? Washing? Oiling? Is your cooling rack coated? I have an uncoated one and then two with a non stick coating and I am worried they are not oven safe. Any ideas on that? we make these from time to time too I always forget how long in the ice water so thanks for the reminder. We have found that using a crinkle cutter knife makes them even more crispie. Freezing raw potatoes in this form would not work very well. When you went to cook them they would likely be mushy and soft. If you want to try freezing them I would suggest blanching them first and then you could try freezing them. I would do this after cutting and the. Do the rest of the steps (minus soaking) after you have frozen them. I have one that is coated and one that isn’t. I’m not really sure what the coating is and so couldn’t say if it is safe to bake in the oven. Try one with no coating is my suggestion! And makes them look fun. Good suggestion! Does this same method work with Sweet potato fries? 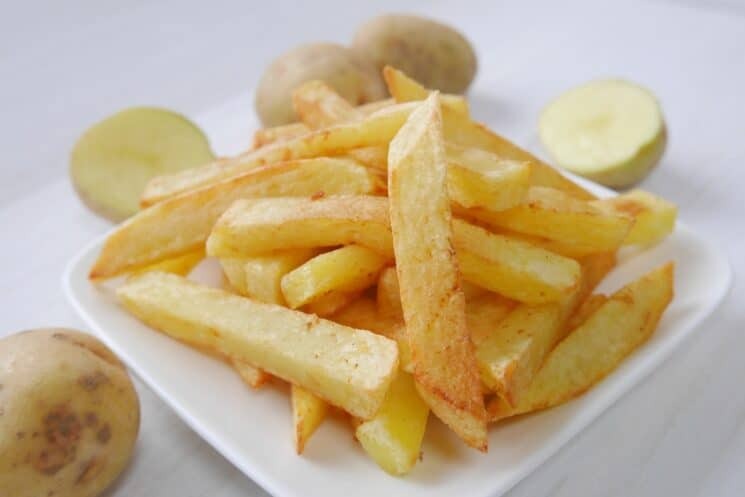 Potatoes in general are really healthy but the way we cook it changes it. Good read. This is a fantastic idea!! !, thank you very much for sharing it!!! 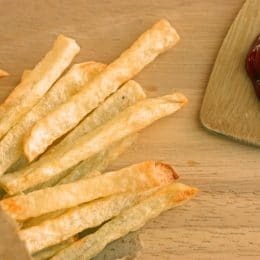 Do you think that this technique would work for making homemade chips? While it’s healthier, it’s not as nutritious as the water-soluble nutrients will be lost. But well, once in a while, it’s a good treat! That would be totally fine! 1. Why not just spritz them with oil in a Mr Misto (pump spray bottle)? 2. 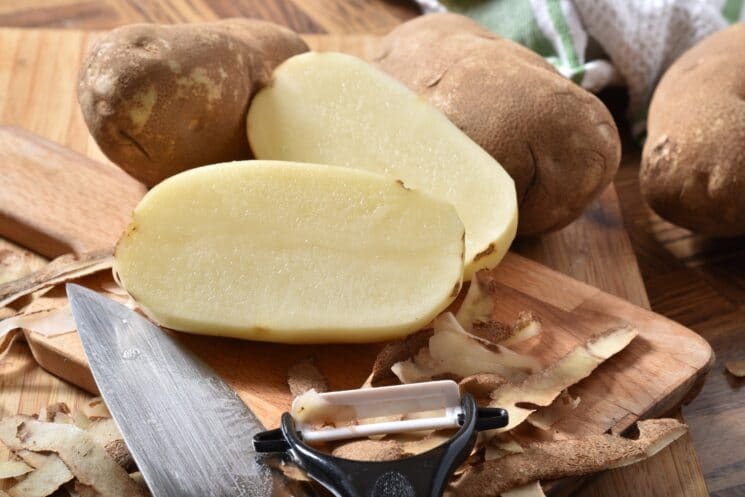 I try to use potatoes skin-on when I can – tastier and healthier – went do you peel? Can we fry the potatoes in oil I mean french fries. What would you say the calorie and sodium intake be on this? do you have to use a rack to let it cool? Also do you have to eat it with kethup? Is kethup like a ingredient? Probably not, but I wanted to know. 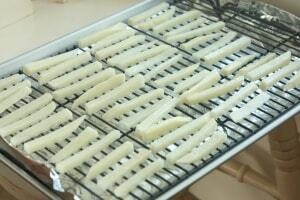 Great post to learn about how to make french fries at home and have a delicious snacks at home. Making these tonight I will send a comment to tell how it goes. This recipe worked perfectly. My new favorite!! !